The area around Camerons Cottage is fenced ensuring complete safety for guests especially those with children and pets. 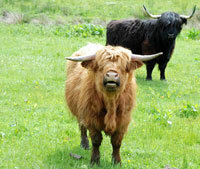 It also provides splendid views of the Highland cattle in the field behind the cottage. Garden furniture is provided for you to use on the grassed area. Breath in the wonderful fresh air and relax while enjoying the spectacular panoramic views. Inquisitive deer can often be seen wandering nearby in the surrounding fields. There is a rich variety of bird life to watch as well as the cheeky native red squirrels. There is an large gated parking area adjacent to the cottage where you can safely leave your car and go away for a walk in the local area and forests. Camerons Cottage provide a barbeque for guests to use. Please use this with great care. However the main attractions are the animals that live on the farm. 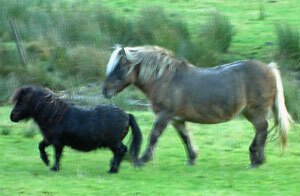 At the moment we have two ponies - a small black Shetland pony called Oden and a larger ex-working Highland pony from the Isle of Rum called Rummy who are great friends and follow each other round the field. Very easy to tell them apart. However our main attraction is the magnificent herd of long horned shaggy Highland cattle that form a very important part of Glenlia working farm. We have recently had a new calf born to mother Iris who is very protective of her offspring. The calf was named Pipa by the children.